There are millions of beautiful people from every walk of life. Many of them we know. Their calling cards might be compassion or joy or a choice to celebrate the uncertainties of life rather than avoiding them. We hold them up as shining examples of how to live our own lives. There is an unspoken sense they these people have achieved something ideal, something that we might want to model our own lives after. If we could only be as happy, or beautiful, or friendly. More often, though, the beautiful people that we encounter don’t live in the limelight. Their names aren’t well known. The significance of their stories is lost beyond the few people lucky enough to get to hear them. But, when your life does get to intersect with a person like this, there is an everlasting impact. You take part of their story as your own. You identify with them on a level that is core to who you are. My grandfather was one of these people. Lloyd’s story is one that is so simple that it is extraordinary by today’s standards. After marrying my grandmother more than sixty years ago, he began raising a family without electricity or indoor plumbing. The condition of the roads into his little village made the ocean a more viable option for travel. He relied on others, and they on him, for everyone’s mutual well being. 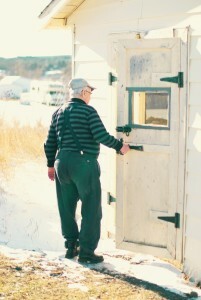 In a very real way, he lived off the land – not by choice but of necessity. The produce section could be found in the garden outside or the cellar down the hill. It was twenty feet out the front door to the ocean where dinner was most often found. At a time when the world was advancing quickly, my grandfather’s village remained isolated. The cost to bring in much needed infrastructure was too high and the government opted to resettle people instead. They sold their little house – which was later removed from its foundation and floated across our little bay to a new location – and moved just a few hundred feet from where I would eventually grow up. I always remember him as an extremely hard worker especially in the years that he operated his saw mill. Every day, the air was full of the smell of the exhaust from the gasoline motor that powered the blade. Several mornings, I remember waking up to the rumble of the engine and the rhythmic whining as the blade sliced tree into lumber with each pass. As a child, I spent many hours playing the pile of coarse sawdust outside, my little Tonka bulldozer mimicking the power of my grandfather’s own full size tractor. Even with access to modern amenities, he worked hard to provide in the best way that he knew how. With his hands. With brute force. With the back breaking labor that was as normal to him as our desk jobs are today. I remember my grandfather as being a well-liked and social man. In the evenings after a long day’s work, it was common for other men from around the community to come and sit with pop. Here is where stories would be told time and time again. Tales from the good ol’ days when things were different. Whisky and Pepsi usually helped these stories along and I remember lots of laughter. The air was full of cigarette smoke and memories of a time long since faded. For many years, for many reasons, I didn’t fully appreciate this man or his story. Much of my own pursuit involved educational opportunities or religious practice. The combination of alcohol and smoking made the evening story sessions hard for me to stomach and I would usually be sure to leave before things got into full swing. Comparing my childhood to my grandfather’s experience would be like comparing the royal life to that of a peasant. The life of purity that I had been pursuing felt at odds to the grit of my grandfather. I loved him but, on some level, we never really related. And it continued this way for many years. I moved, first to college, and then to the United States. Many months would pass between visits. 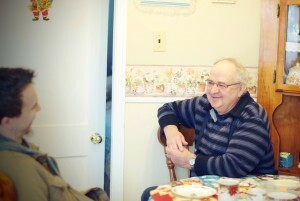 My trips back home would involve obligatory visits with my grandparents in order to catch up. I can’t pinpoint when or how my perspective changed. I know I began develop an appreciation for the simpler things. There was an innate drive within me to grow vegetables in my urban backyard. I began to build compost bins and tables from raw wood, without plans or know how but from desire and curiosity. These were the echoes of my grandfather’s life in me. By the grace of God, I began to hear them. The passage of time is often cruel. In my grandfather’s life, this was realized in the way that so many of his friends went before him. One by one, time stole from him his connection to the past. There were fewer and fewer friends stopping by, fewer folks with whom he could reflect and remember – fewer folks that would understand. Perhaps it is by chance that my soul has aged much faster than my 36 years. It could simply be a fluke that I yearn to connect with the earth, to see life come up from the soil, and to craft objects from raw wood. But I like to think that there is something sacred at work here. 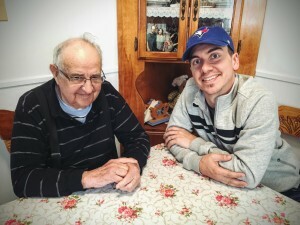 Whatever the motivation, I knew that I needed to connect with my grandfather. I knew that, during my next trip home, my visit with my grandfather would be anything but obligatory. My memories from that next trip are pretty vivid. I remember sitting at their small kitchen table and the shock in my grandmother’s voice when I announced that I wanted to have a glass of whisky with my grandfather. I remember sitting there on a beautiful Newfoundland summer afternoon, the sun shining through the small kitchen window. I remember my grandmother getting the Pepsi from the refrigerator as I opened the bottle of whisky I had brought from North Carolina. I remember hearing the same stories that I had heard for years, my grandfather’s voice only slightly more gruff than the last time. I remember the laughter and the more solemn moments as they intertwined having been momentarily conjured up from a time gone by. I remember sipping from my glass and taking in every moment. It was important to me that this newfound connection be honored and absorbed. I like to think he felt it too. With each trip home, this ritual replayed itself. For me, I wanted to both drink in the moments for myself while honoring this man with my attention. I could be no stand in for the men who had come before me, but I could do my part to let him know that his memories are cherished and that his legacy would not be a victim to the tyranny of time. We poured a glass. He told stories. I listened and laughed and loved every moment of it. We both knew what was happening. We both knew that this would be the last time he would sit with a friend and commune in this way. We drank in every last sip. My grandfather passed away this morning. He has moved on to whatever comes next, where he has the upper hand over time. My own view of whatever comes next has changed and morphed over the past few years; while I have some thoughts, I don’t claim to know with any kind of certainty what that is. But I know that he lives on. I know that my own spirit and mind and character somehow contain his fingerprints. The same hands that toiled at the ground and wrestled trees and held that last glass of whisky have crafted something in my soul. I’m honored and grateful that I allowed my story to intersect with his. Pop – I’ve been missing you for years now while I’ve been living away. I knew what it was to grieve the idea that we could only spend a few days a year together. I’m used to missing you but this is different. It’s permanent. It might not even be real to me until I am able to come home again and to truly experience being there without being able to spend time with you. But, I’ll look for you. I’ll remember your stories. Every time I light a fire or build a table I’ll think of you. Thank you for your friendship. Thank you for welcoming me and sharing with me. Thank you for loving me in the way that I know you did. Cheers to a life of hard work. Cheers for now being able to rest. Grandfather. The worlds loss is Heaven’s gain. I also have memories of your Grandfather. I remember going up there as a child with my dad. We would bag sawdust for hours and he would stop and chat/ tell stories when he wasn’t busy sawing or hauling wood. I have also sat to that table once or twice as a boy while uncle Lloyd and dad talked. He will be missed for sure. One of the last of a dying breed. Bernice Elliott Major ) R.
Desmond ,You have penned a wonderful picture of the relationship between you and your grandfather and the memories will now be very special to you. Sorry to hear of his passing and my prayer is that God will bless you and your family during these days. God Bless. what a lovely tribute to a wonderful man.Hold on to your memories and God bless. Very touching. Thanks for sharing. Heather Whittle, Edmonton. Your grandmother is my great aunt. I enjoyed reading your heart warming tribute to your grandfather! I did not know him or you for that matter, but I felt compelled to comment on how wonderfully written it is, how your words paint a picture of a man so familiar to me, but only through words and stories! If only I could have experienced this first hand, as you have! I am sorry for your loss! Thanks so much for commenting! He was a good man and I appreciated your kind words. your words are eloquent….what a beautiful tribute to what seems an awesome man….it makes me sorry that didn’t know him. My deepest sympathies to you and yours. His memory will love on in you. Thanks Denise! He was a good guy and I’m so happy to have gotten the chance to get to know him so much better as an adult. It’s funny how much of him and his past I see coming out in my own life – doing work around the house, gardening, building tables 🙂 It’s a fine legacy to be a part of.